HandKrafted by Stephanie: Taylored Expressions May Stamp of the Month Blog Hop! Taylored Expressions May Stamp of the Month Blog Hop! Hello! 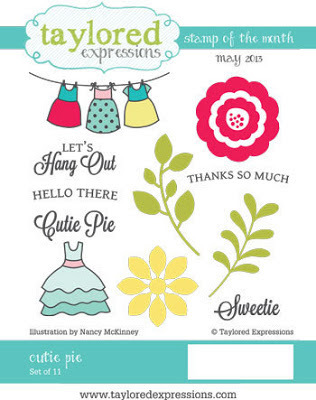 Welcome to the Taylored Expressions May Stamp of the Month Blog Hop! You might already be familiar with the TE Key Ingredients, well now Taylor has added a TE SOTM (which will coordinate with the Key Ingredients. You will have the option to subscribe to either one or a combined Deluxe Key Ingredients which includes both! Here is a link to the new US SOTM option. I combined the May Stamp of the Month (Cutie Pie) with the May Key Ingredients (featuring patterned paper from the Echo Park Sweet Girl collection) to make a scrapbook page of Sabrina and her ballet teacher, Mrs. Caroline. All patterned paper, cardstock and ric rac are from the May Key Ingredients. The "thanks so much" sentiment is from Cutie Pie and was stamped onto a banner die cut from Branches, Banner & Bloom, which is a new TE die set that coordinates with Cutie Pie (sold separately and available in the TE store now). Once again I used the Whimsy Alpha dies to create my title. I added tiny sequins and a small pearl as my period and to dot my "i". 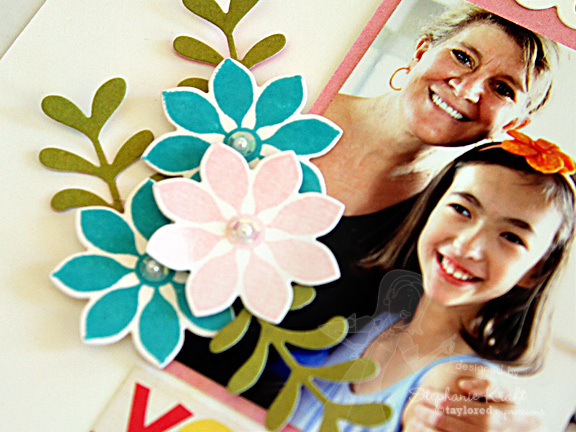 I stamped the 3 flowers from Cutie Pie and die cut them with Branches, Banner & Bloom. The leaves are die cut (from same die set) from patterned paper. Each flower was popped up and again, I added a tiny sequin and pearl to the center of each flower. Accessories: Taylored Dies: Branches, Banner & Bloom, Whimsy Alpha (Taylored Expressions); Ric rac (from May Key Ingredients), Sequins, Pearls (Kaisercraft), Foam tape, Thread, Sewing machine. Love this Stephanie!! 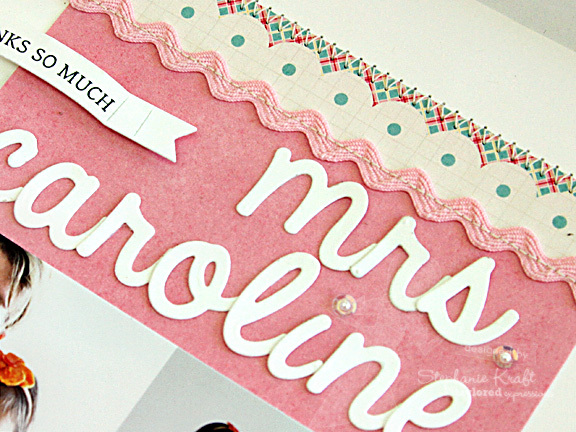 No doubt Mrs. Caroline will love it too! So sweet, Stephanie! Happy 10th to Sabrina, hope she had a fabulous day! Hope you find someone just as special as Caroline too...love your layout! Awe, such a sweet LO Stephanie! Surely this will be treasured for years! Love the beautiful blossoms! Hope Sabrina had a wonderful birthday celebration! Happy Birthday to your daughter! Such a sweet layout and a wonderful keepsake! Oh my goodness - that page is so so so pretty! And Happy Birthday Sabrina! Gorgeous layout. Love all the details.